In flight, resembles Green (which see) with dark upperparts, head and wings and contrasting white rump; differs in whitish (not black) underwing-coverts, longer feet-projection (does not look cut off at rear) and characteristic call. 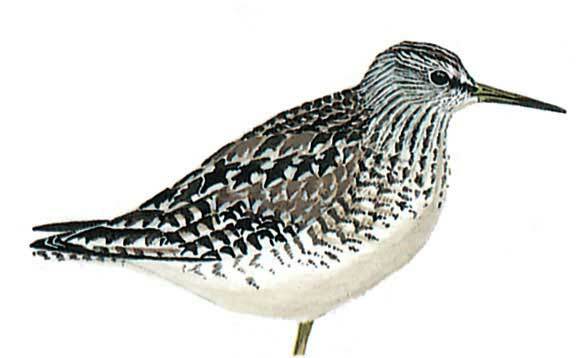 When perched, adult shows brown upperparts boldly speckled whitish, conspicuous long supercilium, and rather long, yellowish legs; general appearance is a more elegant, paler and less contrasting wader than Green. Juvenile has buff-spotted upperparts, somewhat recalling young Redshank (but note yellowish or greenish legs).